Come next January, our dysfunctional system will have to function. Here’s one possible path toward an outside-the-box budget deal. It’s January 2013. The treasury secretary has warned that we’ve run out of maneuvering room to avoid hitting the debt limit again, bringing back memories of August 2011. This time, though, the debt-limit drama is happening at exactly the same time as contentious debates over the massive spending cuts triggered by the 2011 debt-limit deal and over the 2001 and 2003 tax cuts, which were allowed to expire at the end of 2012 due to political stalemate but are likely to be replaced or resurrected in some form. This trifecta—debt limit, sequestration on spending, tax cuts—is occurring right at the beginning of a new presidential term, the brief but auspicious honeymoon period for legislative action. Furthermore, even if the rest of 2012 turns out relatively well for economic growth, the labor market will remain weaker than normal in early 2013—which should further motivate legislators to avoid the substantial and immediate fiscal contraction that would occur if the tax cuts and spending cuts were to be implemented in full. If ever there were a time for a big legislative package, early 2013 would be it. And yet there’s reason to question whether meaningful legislation will emerge from this maelstrom, especially if the President is not from the same political party as the majority in the House and the Senate. Despite mythology to the contrary, divided government has never been particularly conducive to important pieces of legislation—and more importantly, the rise of polarization and the decline of moderates in Congress makes the hurdles of divided government more challenging than they’ve ever been during the postwar era. As a result, it’s entirely possible we’ll have another placeholder or “framework” deal in early 2013—embodying the false hope that with just a bit more time, we could finally reach a more substantial agreement. Instead, major legislation is more likely to succeed on a partisan basis. But that’s only possible in the rare instances in which one party wins the political trifecta—the White House, the House of Representatives, and close to 60 votes in the Senate. Furthermore, a party that uses those rare moments of political supremacy to enact significant legislation on a partisan basis will typically suffer enough backlash to destroy the temporary dominance. We need not, however, lose all hope, even with divided government. After all, and however improbable it seems right now, it’s possible that the drama of early 2013 will produce an agreement that avoids undue immediate fiscal austerity while modestly reforming the tax code and entitlement programs. The 1983 Social Security reform bill, the 1990 Andrews Air Force Base budget deal, and the 1996 welfare-reform deal have created an impression, especially among policy-makers and pundits in Washington, that divided government in the United States has historically been more conducive to significant legislative undertakings than unified government. 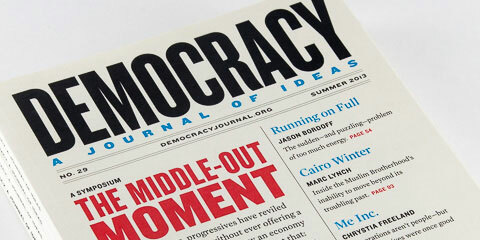 In a 2004 piece in The Atlantic extolling the virtues of divided government, Jonathan Rauch wrote, “Divided control…draws policy toward the center; and by giving both parties a stake in governing, it can lower the political temperature so that even daring changes (tax reform, welfare reform) seem moderate.” Rauch is not alone in suggesting that divided government may not be problematic, and indeed may be more productive than the alternative. The evidence from the political science literature, however, shows that impression is misleading. Most of the policy-making and punditry world still yearns for the days of the Medicare deal, but they are largely if not entirely gone. When I became director of the Office of Management and Budget, I was lucky because I had just come from being director of the Congressional Budget Office—and since the CBO is a nonpartisan agency, I had good relationships with many Republicans. At my confirmation hearing, one of those Republicans said that even his Republican friends seemed to like me—and then asked how long I thought this feeling of bipartisanship would last in my new job. He was prescient: Many of those relationships quickly frayed. Indeed, although a few agencies like CBO operate on a nonpartisan basis, there are now remarkably few people in Washington who work well with members of both parties, a reflection of the polarized environment. The broader lesson for presidents is clear: Unless they have sufficient votes to legislate only with members of their own party, they’re much less likely to enact major legislation—that is, without surrendering key policy objectives to the opposite party. So what’s happened to the moderates? As the data assembled on Voteview.com (a website maintained by political scientists Keith Poole and Howard Rosenthal that contains data on congressional voting patterns) demonstrates, the most conservative Democrats in Congress 50 years ago often voted together with the most liberal Republicans. That common ground was dwindling by the 1980s; today, it is almost non-existent. Much of the shift has occurred because Republicans have become substantially more conservative. A popular explanation among pundits for the rise of polarization and the decline in moderates is gerrymandering—that districts have been redrawn to make them safe for one party or the other, allowing more partisan representatives. But it’s mostly wrong. One study by Sean Theriault of the University of Texas at Austin showed that only a tenth to a fifth of the rise in polarization since the 1970s can be attributed to redistricting (other estimates are even lower). Nor is polarization just an inside-the-Beltway phenomenon, as some have suggested. From 1996 to 2008, most state legislatures also experienced striking increases in polarization, according to data assembled by McCarty and Boris Shor of the University of Chicago. If anything, over that period, most state legislatures polarized even more rapidly than Congress did. The first level involves dampening the degree of polarization in the population itself. To the extent that polarization is being driven by increased income inequality, one pathway to constraining it is to pursue policies (such as a more progressive tax code) that narrow after-tax income gaps. Another pathway is to highlight the importance of diversified interactions, both physically and virtually, to avoid the extremist tendencies that occur with self-reinforcing views. In speeches on college campuses, for example, I’ve been trying to communicate to students the importance of reading and listening to arguments from those with wildly different political views—because doing so will not only better inform their own thinking, but may also provide a broader social benefit by mitigating polarization. We should also remember that polarization has occurred in long waves in the past. Epochal shifts, such as world wars and the Great Depression, have brought Americans together and attenuated schism. It is possible, though not pleasant, to imagine similar catastrophic events that would offset the intensifying polarization among the public and in Congress. The third and final level addresses the problem of how to govern assuming a given level of polarization and a general absence of moderates in Congress. Within this category, two approaches suggest themselves. The default approach is for both parties to aim for partisan dominance and unified government, and then to legislate on a partisan basis. This partisan legislative approach represents an understandable and potentially effective response to polarization (at least from the perspective of legislative success). If you can’t govern in the middle, might as well govern, even if it is from one side. What to do during those periods of divided government (which is likely to be most of the time) with few moderates? As I have argued elsewhere, the best we can do to avoid gridlock may be to expand the degree of “automaticity” in the legislative process while retaining full congressional prerogatives to unwind such automaticity. For example, rather than requiring specific affirmative votes in Congress to extend stimulus measures, a better approach is to tie the stimulus measures to an objective indicator, like the share of the population working, and have those measures continue as long as the indicator (in this case, unemployment) is above a specified level. That way, the measures remain in effect as long as they are necessary, without the need for new legislation (though Congress can retain full authority to undo the measures at any time). Similarly, even a divided Congress is often able to agree upon a process with uncertain outcomes, such as the creation of commissions tasked with finding solutions that take effect unless voted down by Congress. The base realignment and closure (BRAC) process provides a powerful example. It seems implausible that Congress would be able to agree upon which military bases to close through the normal legislative process. But through the BRAC process, first enacted in 1988, Congress delegates the job of choosing which excess military installations to close down to an independent commission, whose recommendations go into effect unless specifically voted down by Congress. The BRAC process—and others like it—works because it creates sufficient ambiguity about specific outcomes that objections are muted at the time of creation; the power of inertia then explains why the specific outcomes are allowed to take effect. For that second stage to work, it is essential that the proposals take effect automatically unless they are voted down by the Congress. This logic is reflected in the Independent Payment Advisory Board that was created as part of the health-care reform legislation to determine Medicare rates and rules. Given the overwhelming case for a major deal in early 2013, the difficulty of seeing how it could come together at this point only underscores the new political economy. It is not impossible to imagine, given the difficulty of passing bipartisan legislation and the distance between the Obama Administration and the House Republicans over tax policy in particular, that we will wind up with another “framework” agreement that leaves out specifics and delays decisions again, or alternatively a series of rolling temporary extensions of the debt limit and other provisions. That type of just-in-time governing would create unnecessary anxiety and uncertainty in an economy that is likely to remain weak relative to its potential. The challenge is nonetheless that House Republicans will have to vote in favor of a debt-limit increase. The Administration’s success in pushing an extension of the payroll-tax holiday this past spring should not be seen as predictive of the 2013 mega-negotiation’s prospects, since the reason for that Administration win was that Republicans had somehow boxed themselves into a position—of appearing to oppose a tax cut—fundamentally contrary to their core views. In early 2013, by contrast, Republicans will again be fighting for tax relief—the ground they typically like to occupy. By changing the discussion to a new tax proposal, it may be a bit easier to perpetuate a higher level of taxation on high-income families rather than continuing to debate the issue within the four corners of the Bush tax cuts. The tax cuts would be designed to avoid or minimize the fiscal contraction at the beginning of 2013, since the economy will remain too weak to handle a substantial fiscal tightening at that point. Ideally, however, even the middle- and lower-income tax cut within this strategy (the payroll tax holiday) would not be a permanent one, since over the medium term the federal government’s revenue base is inadequate for the tasks that have been assigned to it. So the significantly larger payroll-tax holiday could phase out as the labor market recovers. Middle- and lower-income families would be more severely affected by excessive reductions in existing government programs (like Medicare and Social Security) than a modest revenue increase to finance those programs. That core tax package could be combined with other features. For example, we should reform the itemized deductions themselves. Many deductions are intended to promote socially beneficial activities, such as saving for retirement, purchasing health care, or owning a home. Yet with a deduction or exclusion approach, the tax benefit from spending $1 on one of these activities depends on the person’s marginal tax bracket. A person in the 15 percent marginal tax bracket who spends $1 on mortgage interest, for example, enjoys a 15-cent tax reduction from doing so; a person in the 35 percent marginal bracket enjoys a 35-cent tax cut for that same $1 in mortgage interest paid. This structure makes little sense from either a fairness or an efficiency perspective (as Lily Batchelder, Fred Goldberg, and I have argued in a Stanford Law Review article). A better approach would be to give each of these taxpayers, say, a 20-cent tax credit for each $1 in mortgage interest paid. Adopting this type of progressive approach to itemized deductions may require adding some less desirable policy—such as a second round of a corporate tax holiday on repatriated profits—to make the overall package legislatively feasible. Before the critics start pointing out all the flaws in this strategy, it is worth emphasizing that none of the alternatives, including the one I sketch above, has an easy path to enactment. And that in turn underscores the key point: In a moderate-free Congress, it is much harder to govern—especially in a divided-government scenario. If nothing else, the likely drama later this year and early in 2013 will highlight the challenge of legislating in the new era of hyperpolarization. Peter Orszag is vice chairman of Global Banking at Citigroup. He previously served as the director of the Office of Management and Budget and as director of the Congressional Budget Office.